Examining Bible Truth from the Scriptures alone. What Happened to Jesus’ Earthly Body? Since Jesus was the ‘first to rise from the dead’ (Acts 26), and he will ‘transform our lowly body to be like his glorious body’ (Phil. 3) – it only makes sense to investigate what happened to Jesus’ earthly body? Was it left behind in the tomb to rot and decay? Was Jesus given immortality at his resurrection, or did he already possess an undying spirit before he was crucified? Does it matter? And is the promise of resurrection crucial to the hope of living forever? Did Jesus’ Body Rot and Decay? Later, the guards were bribed to say that the disciples had stolen Jesus’ body away as they slept. (Matthew 28:11-15) However, Peter clearly lays out the truth of the matter in Acts 2. “Remember Jesus Christ, risen from the dead, the offspring of David, as preached in my gospel,” (2 Timothy 2:8) and, “Paul, a servant of Christ Jesus, called to be an apostle, set apart for the gospel of God, which he promised beforehand through his prophets in the holy Scriptures, concerning his Son, who was descended from David according to the flesh and was declared to be the Son of God in power according to the Spirit of holiness by his resurrection from the dead, Jesus Christ our Lord,” (Romans 1:1-3) The earthly lineage of Jesus Christ is very important as it fulfilled personal promises God made to the forefathers. PERISHED? A true statement, if all the Old Testament believers are in their graves, ‘fast asleep’ awaiting the hope of resurrection. A very confusing statement if those Old Testament believers never really died and are happily enjoying paradise now. Our next blog will consider a Greek fable that crept into early Christianity after Jesus ascended to heaven and is now such an established and cherished belief that few realize it can be easily shown to be false. Some would say, “A false hope is better than no hope at all” – but is it? And if we hold onto a false hope, what other aspects of the true Gospel message will become distorted? God Willing, we will look into this matter primarily from Scripture but also with reference to the historical development of this teaching. What happens after death? Is there hope we will live again? Or do we never really die – just change forms? Is resurrection even important? Paul says, “if Christ has not been raised, your faith is futile and you are still in your sins. Then those also who have fallen asleep in Christ have perished.” (1 Corinthians 15:17-18) As much as Jesus’ crucifixion was the sacrifice required for forgiveness – the resurrection of Jesus was also essential for salvation! In speaking about her dead brother, Martha said, “I know that he will rise again in the resurrection on the last day.” (John 11:24) This was the only hope she expressed! But what exactly is resurrection? Paul says that Jesus was the first to rise from the dead, (Acts 26:23) yet several resurrections took place in the Old and New Testaments. In what way was Jesus the FIRST? Is Jesus’ resurrection anything like the resurrection God has promised for us? Does being the FIRST imply that similar resurrections would follow? Notice that Paul says in Romans 6 that Jesus ‘will never die again’ – in other words he has been given the eternal life God has promised to believers, “to those who by patience in well-doing seek for glory and honor and immortality, he will give eternal life;” (Romans 2:7 and 6:23) In all the other resurrections that took place in the Old and New Testaments, people were only resurrected to live and then die again. Jesus Christ was the first to be resurrected to eternal life! Do we have hope of being resurrected like Jesus was? This was certainly the hope that the Apostle Paul clung to and shared with the Philippians. Paul’s hope was to have his mortal body become like Jesus’ glorious body! In 1 Corinthians 15, Paul writes extensively on the hope of resurrection, explaining the supernatural changes that must take place so that we can life forever. We all have lived in the natural body, created out of dust, like our great-great-great ancestor Adam, and just like Jesus Christ 2000 years ago. Through Jesus we have hope of becoming transformed, like he was, into an undying body sustained by God’s spirit power. Some would believe that a part of us never dies, that immortality is something we all possess from conception. This belief makes resurrection rather redundant, which leads many Christians to question why it’s even necessary. Since we are told Jesus is the firstborn from the dead (Colossians 1:18), it is helpful to investigate whether a part of him lived on and departed from his body, or whether his earthly body was brought back to life. The Scriptures are very clear on this exciting topic! Our Discovery Lesson on Resurrection gives a wealth of Bible passages to consider and some interesting word studies to aid our investigation. Is the New Testament hope consistent with what was promised in the Old Testament? Did Jesus and his disciples refer to the Kingdom? Abraham, Isaac and Jacob? Promises? A Paradise Earth? Resurrection? An Inheritance? Or did they preach something new and different? On the cross, Jesus promised the thief beside him, “you will be with me in paradise.” (Luke 23:43) The Greek word for ‘paradise’ means ‘a park, an Eden’. Jesus spoke of the ‘regeneration’ when his disciples would judge the 12 tribes of Israel. (Matthew 19:28) He also cautions against swearing by the city Jerusalem, “for it is the city of the great King.” (Matthew 5:35) In John 14:2-3, Jesus promises his disciples that, “in my Father’s house are many rooms. If it were not so, would I have told you that I go to prepare a place for you? And if I go and prepare a place for you, I will come again and will take you to myself, that where I am you may be also.” Some take this as a promise that paradise will be in actual heaven, but notice Jesus says, “I will come again and will take you to myself.” Does this refer to coming to earth to reign forever? or coming to earth and returning to heaven with the faithful? This is a topic for another blog. Restoration of the Kingdom to Israel? What did the Apostles Preach in Acts? Many times in Acts, the Old Testament is referred to as proof that Jesus Christ fulfilled the prophecies of a suffering Messiah, who had to die and be raised to life. (Acts 2:24-33; 32-37; 8:26-35; 13:27-30, 32-37; 17:2-3; 31-32; 26:22-23; 18:28) The essence of the Gospel message is not new – it is the fulfillment of Old Testament prophecies! Throughout Acts, the resurrection of Jesus from the dead is a crucial aspect of the Gospel message. The Jews and Gentiles could easily believe Jesus had been crucified… but what good was a dead Messiah? Was he really alive again? By demonstrating the healing power of the Name of Jesus, and referring to relevant Old Testament prophecy, the disciples endeavoured to prove that the Messiah was indeed alive again, actively involved on earth, and seated in heaven on the right hand of God. The First to Rise From the Dead? It’s intriguing to consider that Jesus was the ‘FIRST to rise from the dead’. Other human beings were miraculously resurrected in the Old and New Testaments – what was special about Jesus’ resurrection? In what way is he considered the ‘first’? Will others follow? In our next few blogs we will delve into the subject of resurrection, looking first – at THE FIRST to rise from the dead! The 144,000 – literal or symbolic? HELL – A Place of Rest or Torment? “Immortal Soul”- A New Testament Concept? Do We Have an ‘Eternal Spirit’ Within? Does Everyone Have an Immortal Soul? Immortality – When, Who and What? Did Old Testament Believers Hope for Life after Death? 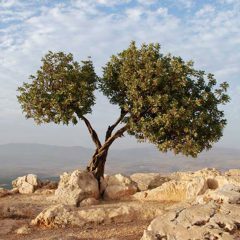 Did Abraham Receive the Promised Land? God Preached THE GOSPEL to Abraham?